Top 3 vegetables that scream fall. Name ’em. So, what number was butternut squash? Come on, it has to be on your list. It’s in season…it’s orange-ish…it’s delicious…what more do you need? Now put it in a pan with chicken and roast it. Easy peasy. Beware – it’s addicting. At least it is for me. I could pop those chunks of roasted goodness in my mouth all day long. Which reminds me – I need to pick up another one tomorrow. Good news – it’s easy enough for a quick weeknight meal. And kid friendly. And cheap. 3 reasons to have it in your top 3! Preheat oven to 450 degrees. Combine chicken and squash in a ziploc or in a large bowl and add oil and spices. Shake until evenly distributed, then put in roasting pan. Cook for about 20 minutes, then remove pan from oven and pour most of the liquid carefully from corner of pan. Return to oven and cook for another 10 minutes, or until juices from chicken run clear. 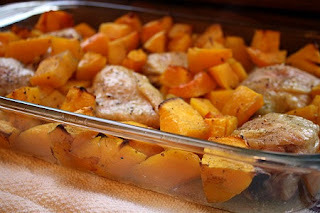 This entry was posted in chicken, main dishes, make ahead, QuickAndEasy, squash. Bookmark the permalink. 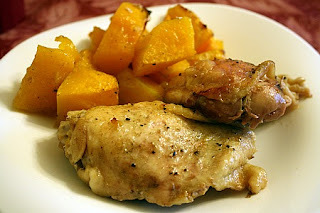 I can eat roast chicken every day- and I love how your picture just screams fall… yum!